Support for Stricter Gun Laws Edges Up in U.S.
WASHINGTON, D.C. -- In the wake of the deadliest mass shooting in U.S. history, more Americans support tighter controls on guns. Six in 10 U.S. adults now support stricter laws covering the sale of firearms, up from 55% last year and the highest percentage since 2004. However, the public is sharply divided over an assault weapons ban, though the 48% in favor exceeds last year's record-low 36%. Americans still widely oppose an outright ban on handguns, but more favor such a ban than in 2016. The latest uptick in support for gun control, from Gallup's Crime poll conducted Oct. 5-11, comes just days after the Oct. 1 mass shooting in Las Vegas, where 58 people were killed and more than 500 were injured. 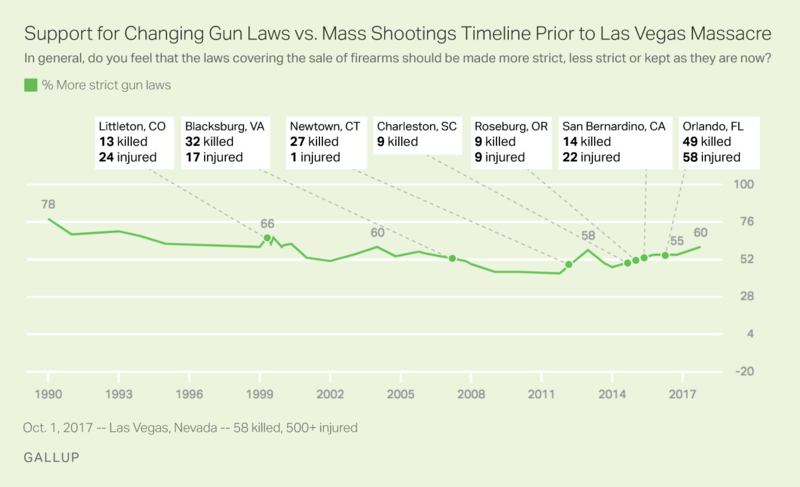 The public's overall desire for stricter gun laws has fluctuated substantially since Gallup's first measure in 1990. 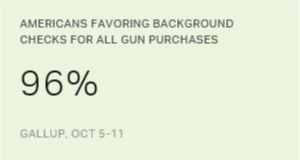 That year, a record-high 78% favored stricter laws covering the sale of firearms. A majority of Americans held that position until 2008. Support then fell to a low of 43% in 2011, when an equal number said gun laws should be kept as is. Public opinion typically shifts in the aftermath of a traumatic national event such as a mass shooting. Shortly after the mass shooting at an elementary school in Newtown, Connecticut, in December 2012, support for stricter gun laws jumped to 58%. Sentiments in favor of stricter laws fell thereafter, only to rise to 55% in October 2015 after nine people were killed and nine were injured at a community college in Roseburg, Oregon. This month's reading marks a five-percentage-point bump from last year among Americans favoring stricter laws (60%), while 33% think laws should be kept as they are now and 5% prefer less strict laws. While a majority of Americans currently support stricter gun sale laws in general, there is a sharp divide in opinions of controls on one specific type of weapon: semi-automatic guns known as assault rifles. These guns, which reload automatically but fire only once per trigger pull, have been used in many of the mass shootings in recent years, including Las Vegas and the June 2016 attack in Orlando, Florida -- the two deadliest shootings in U.S. history. Assault rifles have been a matter of great debate in the U.S. for decades. 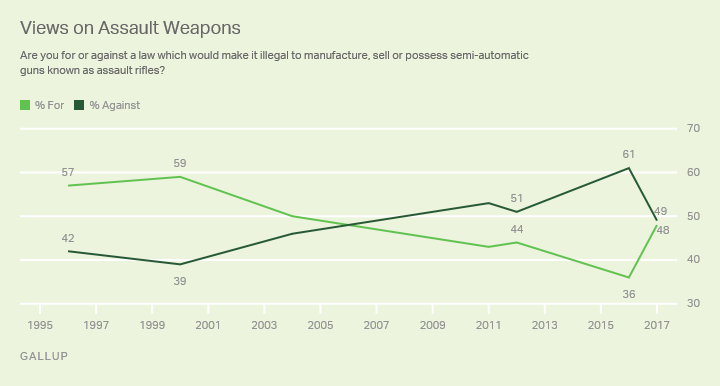 In 1994, President Bill Clinton signed a federal assault weapons ban -- which 71% of Americans supported, according to a Gallup poll at the time. When the 10-year ban expired in 2004, support for it had fallen to 50%. In recent years, opinion has tilted against a ban, and an attempt to pass a new assault weapons ban after the Newtown shooting was defeated in 2013. Currently, the public remains evenly divided, with 48% in favor of and 49% opposed to a law that would make it illegal to manufacture, sell or possess semi-automatic guns. However, support for such a ban is up 12 points since last year. Public opinion on handgun possession is more clear-cut than views on assault rifles. Currently, 71% of Americans think there should not be a ban on the possession of handguns, while 28% think there should be. 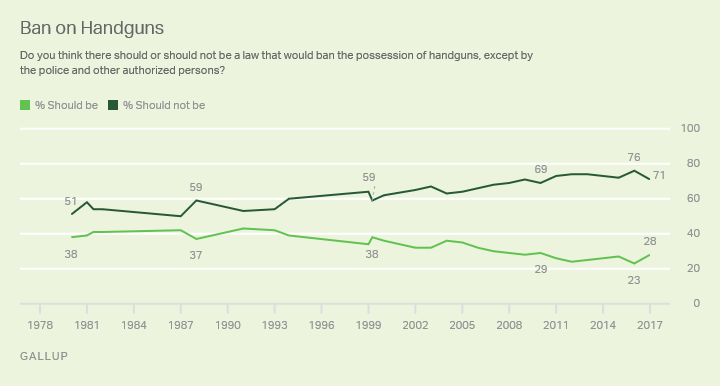 The long-term Gallup trend for this question shows less support for a ban on handguns over time. In 1980, 51% said handgun possession should not be banned -- 20 points lower than the most recent reading. Opinion on this measure has been fairly flat over the past 15 years, but trending toward less support for a handgun ban. The latest reading, though, shows a small uptick in support for banning handguns. The frequency and magnitude of mass shootings have increased since 2000, yet support for stricter gun sale laws was higher and more consistent before then. As is the case with a number of other issues, Gallup has found that public opinion on gun control has become increasingly politically polarized over time. Republicans are less likely than they have been in the past to favor stricter gun laws, and the opposite is true of Democrats. Still, in the immediate aftermath of mass shootings in recent years, the public has leaned toward more regulation of weapons. This is once again the case. It remains to be seen whether this level of support will hold or, as has happened in the past, will fall away as coverage of the latest incident begins to fade.